Sainsbury’s staff and members of PCSA Kent are pictured above at Sainsbury’s supermarket, Westwood Cross, Broadstairs. At the end of July it was announced that the store had selected PCSA Kent as their “Charity of the Year”. This is a fantastic opportunity for PCSA Kent to increase awareness of our support group and of prostate cancer generally and to raise money to support our local hospitals in purchasing equipment to help with the diagnosis and treatment of the disease. 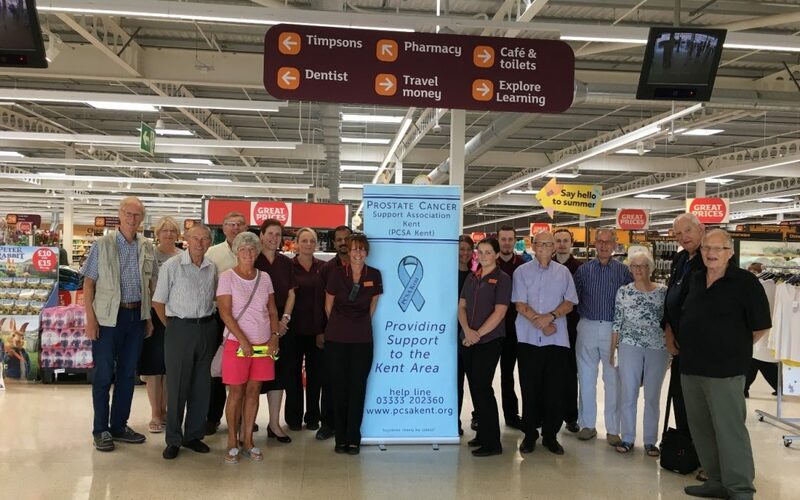 As well as PCSA Kent holding collections and outreach days during the year in the store, Sainsbury’s staff are also helping in raising awareness of prostate cancer and there are collection buckets at the tills in store and also in the fuel station. PCSA Kent is very grateful to the staff for their support and enthusiasm. Chairman of the Association, Terry Laidlaw, said ” The support Sainsbury’s are providing is quite overwhelming and they will make a massive difference in improving the treatment of men with this disease in East Kent”. He urged the public to give generously! PCSA Kent Collection and Outreach Days in the store will be on: Friday 12th and Saturday 13 October, Friday 23rd and Saturday 24th November and Wednesday 19th and Thursday 20th December.